Just shoot me now. I volunteered to build the stage set for my kid’s high school style show, which is a fund raiser for a big lock-in graduation party. The theme is “A Night in Las Vegas”. 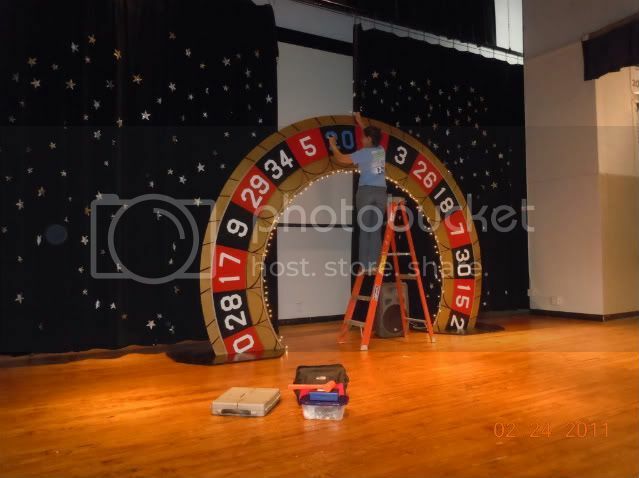 The Decoration Chairman wanted a big roulette wheel the kids could walk through from behind curtains and show off their stylish apparel. You can see the catwalk in the first picture. Well I, being the Decoration Co-Chairman (move over Martha) said, “sure, no problem, I can build that”. The wheel was painted by the very talented Decoration Chairman. The deal was I will build it, and she will paint it. That was a good deal for me. The height of the interior circle is just under 7 feet tall and the total height is just under 10 feet tall. We had some tall kids modeling sports wear. My greatest fear was the roulette wheel falling on the kids so the back side looks like a bridge trussle support system. It was actually to close to the curtain to get a good photo of the back, but I will put it up again for the graduation party, so maybe I’ll remember to get a shot. A few people ask me how I drew up and cut out a perfect circle on such a large scale. First off, I drew a scaled plan. Don’t do this kind of work without a scaled plan. In the third picture you can see my boy drawing the circle on 3/32 hardboard. The string fixed to the center of the circle. Of course, I laid the hardboard pieces together so I only had to cut out half a circle, and a single piece for the top part. Actually it was five pieces total. I cut it with my router using a straight bit. A piece of plywood was used as a trammel fixed to my router on one end and the center of the circle at the other end. The next to last picture is the hardboard skin of the circle laid out on my driveway, no support structure at that moment, just skin. Oh yeah, the last picture shows columns I built (10 total) to hold up decorative hand rails. The tops are store bought. I don’t do lathe. I also built a 12-foot long Las Vegas sign we will use at the graduation party. It’s a monster, but not painted yet. Thanks for looking. then we can party ! cleib – one kid about to graduate, one to go. It was really a pleasure to help out the kids. In my subdivision, most men have never seen a router, unless it’s plugged into a computer. They are mostly country club and polo shirt types, high grade professionals. But no matter what, women are always impressed by someone who can build something. I think it goes back to caveman days, building shelters and such. Thankfully I’m happily married, ha. David – I almost got it right, but the top piece moved a little and we didn’t know it until we were finished routing. We has a skinny 3/8” gap where the two upper pieces met. So I made a filler and glued it on. Like a gap between two front teeth. Fixin mistakes is my speciality! On the other piece I made, I straped all the joints with duct tape. No movement atall. Funny you should bring up publishers clearing house. A few years back we discovered my dad had subscribed to about 20 different magazines. His excuse was he was trying to win the million clearing house prize. Too funny. Big! NIce project, the kids gotta be proud. Hi Jack. Thanks very much. It did turn out well, being most proud it didn’t fall over. It felt good to be a part of this event. A new experience in building stuff! Good for you Dad! I am sure the kids were please. Very nicely done. Thanks for posting.